Hemming Jeans–the cheater’s way, originally uploaded by SewLaTea. 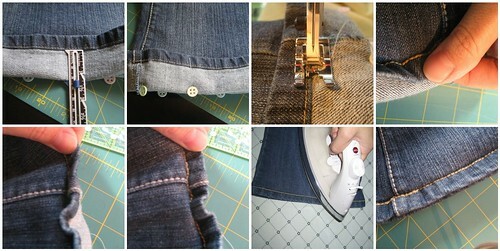 I’ve been hemming my jeans this way for years! I don’t remember where I got the instructions, but what I LOVE about it, is that it keeps the original hem intact….and who wants a fake hem….there’s a reason you like the jeans, so let’s keep it that way! I hope these instructions aren’t too confusing…let me know if they are and I’ll correct it. Step 1: Put on the pair of jeans you want to hem and fold up the bottoms to the right length (I usually err on the side of caution and allow room for shrinkage over time, so usually make them a little bit longer than I really need). Pin in a couple places. Step 2: Take off the jeans. Measure the distance between the bottom of the original hem and the bottom of the fold. Now take the number and divide in half. In my case I had a measurement of 2 1/2…so half of that was 1 1/4. The next part is to then pull down the hem until it (bottom of the original hem to bottom of fold) measures the latter number (ex. 1 1/4). Pin all around the bottom of the leg, measuring as you go. Step 3: You are then going to stitch JUST outside/below the original hem, all the way around. Depending on the jean thickness you may need a bigger needle. Also make sure the side seams are laying flat, as they can be very thick and difficult to sew over. I have a little tool that lifts the presser foot and helps get over that “bump”. Not sure what it’s called. Step 4: fold under the “excess” fabric so that you are left with the original hem, just shorter!